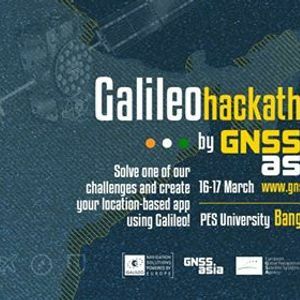 Save the Date: 16-17 March 2019, Galileo Hackathon will take place at PES University in Bangalore, India. We encourage teams with a diverse background to join us and to use Galileo in order to address one of the different challenges in smart cities & urban mobility, safety and health. Every participant will have a unique opportunity to receive guidance and mentorship from GNSS and Galileo experts from the European GNSS Agency, GNSS.asia, PES University, Burdwan University and many more! Registrations will open in January.